I was browsing through my pictures that was tagged to me by some friends, and this picture here really bring back memories. This was taken when I was in high school, I believe I was in first year in here. I joined the school band and bugle corps as a drummer. It was really a great experience as we were able to compete to different places in our region. 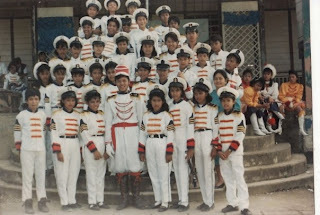 Every time there were events in town, our school band was also invited to join either in a parade or exhibition. I was a drummer until I was in junior high. In my senior year I joined the CAT under the Medics platoon. We're always on the sideline every time there was pass in review or during trainings and formations. But I really missed playing the drums. After I finished with the band, I sold my snare drum for a much cheaper price to a lower year. I was thinking of giving it to my sister, but she did not join as a drummer but instead a musser glockenspiel player, or we call it xylophone on lyre. Now that I will not be playing those again, I am thinking of letting our girls play in a school band when they grow a little bit older. Her school right now is only accepting band players in 5th grade. So she still has a long way to join. I am looking at violin for her to play or maybe learn the piano when she'll have the chance. our school did not have a drum and bugle corps, just the CAT. i was only a private and was not so into extra curricular activities, just the school paper. anyway, photos like these really bring back old memories. oh wow! so you have a music talent in you mami bless? it's nice that you're able to see this photo once again :D it did brought smile on your faces huh? Oh wow you all looks cute. Also that bring memories too in my high school days. isn't it amazing to bring back memories using FB? i have some classmates who uploaded old high school pictures of ours too! It was fun bringing back good old days! Wow.. hi, little drummer girl.. :-) Oops.. that was before when I say little, but now you're already big Momi Bless! I wonder if you still know how to use that drum and play it with the tune of the lyre. I think if you forgot, it's not completely. Maybe you still know the basic ones. Anyway, it's great to know Momi that you also want your two beautiful cutie pies learn to play the band in the school. That's awesome. And so, thanks for sharing! Regards. This photo sure is very nostalgic for. i enlarged the photo and if i am not mistaken, this is you the curly haired girl standing in front, next to the boy. it is an honor to know you were very active in school..i hated CAT back then.i ended up joining the admins. That must be a one memorable experience to cherish, Sis. 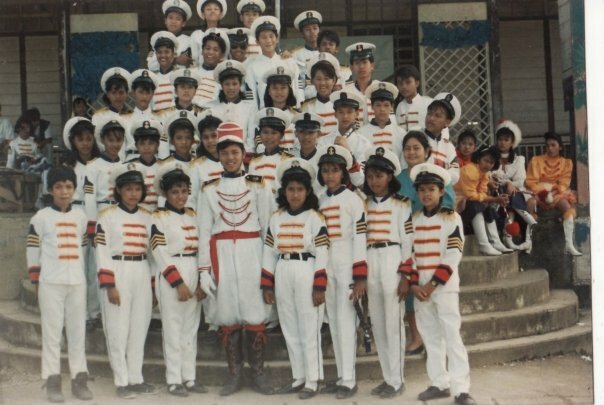 I've always admired those who were part of the drum and bugle corps in school back then but I really didn't get the chance or might be that I really never showed any interest at all. It's pretty cool that you'd also want your kids to experience what you've had. I am sure the'd love it too. The Fairy Hobmother Visited Me!